Mice are one of the animals that have been domesticated the longest; over 10,000 years. Pet mice as immensely popular. Learn how to care for mice as pets. Pet mice can become quite friendly if socialized correctly. Mice are very intelligent. They are fun to watch, many enjoy running on rodent wheels; they enjoy making nests. Mice can be quite timid and it takes time and patience to socialize them. The mouse can make a good pet for the right person; in fact, the perfect pocket pets. The mouse is an easy to care for pet and they are very undemanding. They can be sweet and do enjoy being held. Just like the rat, they make a good first pets for kids. Rats and mice are some of the best pets for kids. Young children need to be supervised with any pet or animal. Choose a reliable and reputable breeder. Some pet stores carry mice. Make sure the mouse is healthy with shiny fur and bright eyes. Check to make sure it is active, alert, and not lethargic. You will see the term fancy mouse; these mice are a result of selective breeding resulting in different patterns and colors. Any mouse will make a good pet it need not be a Fancy mouse to capture your love. 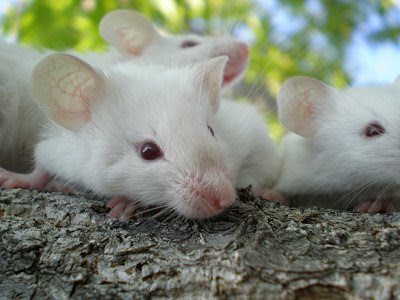 Fancy mice are often shown in mice shows, rodent shows, or pet shows. Mice don’t need a lot of space but a cage of at least twelve inches is necessary. Glass aquariums work will but make sure it is secure with a metal grate lid and has plenty of circulation. If you use a wire cage, do have a solid floor because mice are prone to foot sores. Make sure the wires are spaced so that the squares are very small. A plastic cage may work for domestic mice, but I doubt it because, I had a wild baby mouse chew through one. There are many hamster houses available that will work fine for a mouse. Two females can be housed together. Females make better pets the males. The male has very strong smelling urine. Keeping their cage clean will help eliminate the odor problem. Two males together will fight, injure, and kill each other. If males are from the same litter and are use to being together they can be kept together. Exotic pets like mice are social critters and should have a roommate. Use caution because mice will bite if frightened. Many pet mice have found themselves living with students in university dormitory rooms and in apartments. They are quiet and take up little space. Never use pine or cedar as bedding for the cage as with any caged animal it will kill them with the volatile oils. I have always preferred Aspen shavings. They will enjoy a dark hidey space to sleep, throw in some unscented tissues, paper towels; he will enjoy making his own nest. Provide a safe rodent wheel for exercise. A mouse needs exercise. Provide chew sticks for the ever-growing rodent teeth. He will enjoy toys, even simple toilet paper rolls. They love to explore. I have made my mice boxes with partitions, assorted holes, ripped up paper, little toys. I hide small treats here and there. I change with frequently to add variety to the little critter’s life. I also sit there and watch his every move. Many rodent mixes are perfectly fine for a pet mouse. Often the mouse won’t eat the pellets in these mixes but that is perfectly ok. You can make your own mix to supplement his diet or to use exclusively. Here is a recipe. Divide into small freezer bags. Freeze the mix, bring one out, thaw, and give to your mouse. Keep in mind there is cooked food in this mix and it will spoil. Remove food in a short while. The dry version is good to keep in the cage for the hungered. Leave out the cooked food and omit the molasses. Sunflower seeds can be used as treats, the mice love the seeds, but sunflower seeds are very fattening. You can supplement the diet with fruit, vegetables, cooked egg, Cheerios, (good treat) I am pretty sure without asking a mouse directly, peanut butter is an all-time favorite. Offer very small amounts once in a while. Do not feed chocolate, caffeine, citrus fruits, or corn. Corn seems to not be well tolerated, resulting in a skin rash. Always provide plenty of fresh water filtered water. Use a small water bottle with a chew guard. Keep the cage and all accessories clean and sanitized. This is the number one with of any pet; it will help keep them healthy. The mouse’s lifespan is from one to three years, you can help him achieve the three years with a healthy diet, cleanliness, and keeping him safe. I have heard of exotic pet mice living to five years or more. Let your new little pet rest for a day after you bring him to his new home. Begin talking to him in a soft and loving voice. Put your hand in the cage so that he can become accustomed to your scent and your presence. Start feeding good treats while he is still in “cage bonding.” You are working toward the mouse climbing onto your hand. Once you get to this stage you can begin holding him outside of the cage. Be very careful they can get hurt, or get away and become lost. Once the mouse has bonded you will greatly enjoy each other’s company. Mice are intelligent you and your mouse can learn different tricks together. Above all enjoy your pet! Ferrets: A Complete Guide available in paperback, PDF, and Kindle. By Diana Geiger (me:) Five star reviews! I also found it at Barnes and Noble Online and I expect it can be ordered from any book store.